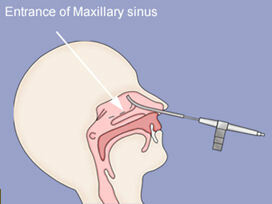 Diagnostic in cases of chronic mucopurulent sinusitis, washouts can be performed under local or general anaesthesia. They are of little therapeutic value. Spray the Nose with Decongestant and local anesthetic. I always infiltrate the inferior meatus with Xylocaine and adrenaline using a dental syringe. 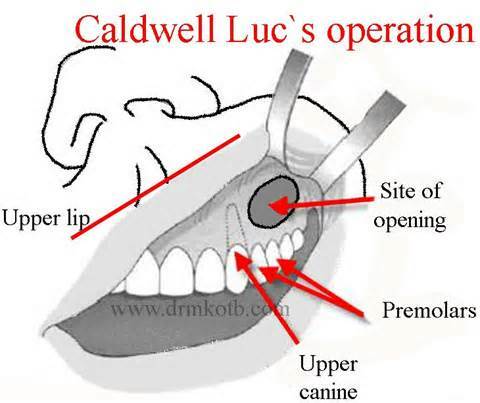 A fine trocar and canula will be pushed into the nose and through the thin bone of the maxilla into the sinus. Saline water will be flushed through the canula into the sinus. The saline will come out of the ostium of the sinus, and drain into the nose. Any pus or infected fluid will come out as well. A specimen of the infected fluid will be taken so that it can be send for microbiology tests. The canula will then be taken out. Hardly any pain or bleeding. The inside of the nose usually heals very quickly. This acts as an aid both to ventilation and to mucous drainage. Ventilation is the major therapeutic benefit. Access during endoscopic procedures is possible via a middle meatal antrostomy, but the standard approach for lateral nasal wall puncture is an inferior meatal one. Submucous resection of septal cartilage is often required to permit access to the lateral nasal wall and thence into the antrum. This is performed via the canine fossa via an intra-oral incision, the anterior wall of the antrum is windowed. Inspection under direct vision is possible via this approach. Good access to intra-luminal pathology is achieved. Some surgeons advocate covering intra-nasal antrostomy. 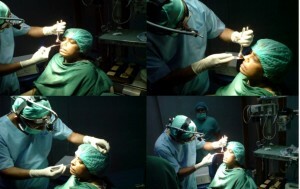 The procedure is occasionally complicated by permanent fistula formation, infra-orbital anaesthesia and damaged teeth apices.